If you want OpenStack integration with OpenDaylight, you will need this feature with an OpenDaylight provider feature like netvirt, group based policy, VTN, and lisp mapper. For provider configuration, please refer to each individual provider’s documentation. Since the Neutron service only provides the northbound API for the OpenStack Neutron ML2 mechanism driver. Without those provider features, the Neutron service itself isn’t useful. The Neutron service provides northbound API for OpenStack Neutron via RESTCONF and also its dedicated REST API. It communicates through its YANG model with providers. As the Karaf feature includes everything necessary for communicating northbound, no special configuration is needed. Usually this feature is used with an OpenDaylight southbound plugin that implements actual network virtualization functionality and OpenStack Neutron. The user wants to setup those configurations. Refer to each related documentations for each configurations. There is no specific configuration regarding to Neutron service itself. For related configuration, please refer to OpenStack Neutron configuration and OpenDaylight related services which are providers for OpenStack. While OpenDaylight is running, in Karaf prompt, type: feature:install odl-neutron-service. Wait a while until the initialization is done and the controller stabilizes. 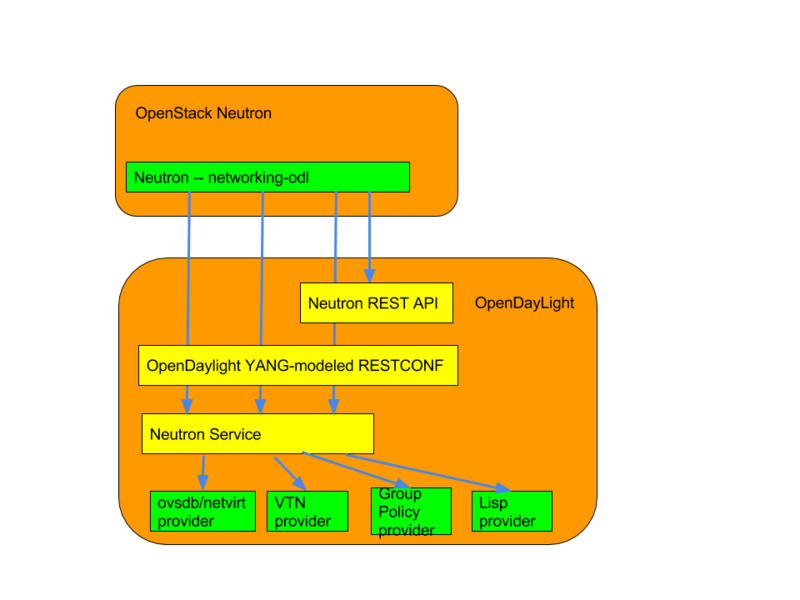 odl-neutron-service provides only a unified interface for OpenStack Neutron. It doesn’t provide actual functionality for network virtualization. Refer to each OpenDaylight project documentation for actual configuration with OpenStack Neutron. Another service, the Neutron Logger, is provided for debugging/logging purposes. It logs changes on Neutron YANG models.